If you've been tuning into the Olympics for the past week and a half, chances are you've caught a medal ceremony featuring someone from Team USA (I mean... they've got 72 medals and counting, so it'd be hard not to). 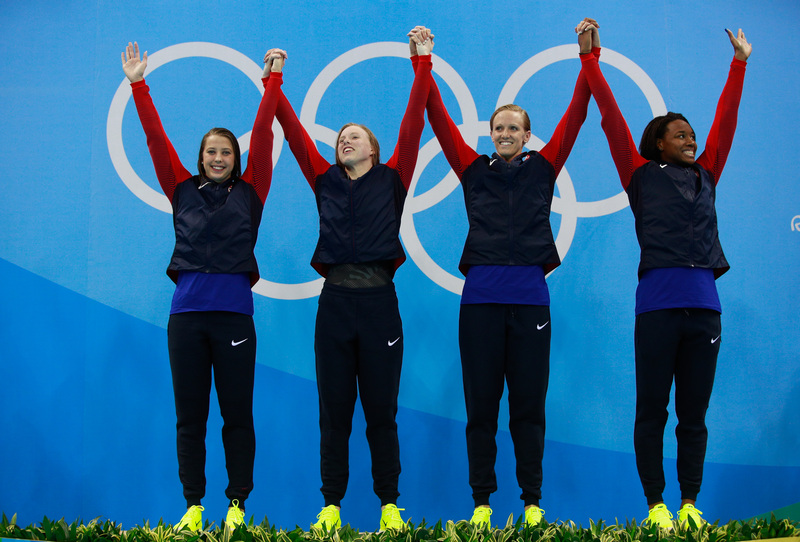 If you're like me, you were probably distracted by the bright yellow sneakers Team USA wears during medal ceremonies, because the eye-catching shoes are hard to miss. Although most of Team USA's clothing is provided by sponsors, I had to wonder where I could get them, and just how much the yellow sneakers cost. Well the good news is, I found that answer. After a friend mentioned to me how much she wanted the neon yellow sneakers Team USA was wearing, I had to check them out. And let's be real, how did I miss them until now? The bright yellow shoes totally stand out from the Team USA athletes' red, white and blue tracksuits. As soon as I spotted the shoes, I had a feeling they were Nikes, and it turns out my intuition was right. The shoes are apparently Nike Free RN FlyKnits in a bright yellow color called Volt. And I mean, check out how good they look on Team USA. They coordinate pretty well with those gold medals if you ask me. So just how much will they set you back? They're a little bit pricey, but on par with other Nike sneakers. The exact pair costs $130. There's obviously also a men's pair, which retails for $130 as well. Although they're a little pricey, they're about what you would spend on a normal pair of Nikes. And if you can look like Team USA while you're doing it, all the better. Team USA swimmers look pretty fly. I don't know about you, but I'm adding these shoes to my wish list.